Crosby, Stills and Nash once sung of colored cottons hanging in the air and cobras being charmed in the square in their hit ‘Marrakech Express’ and photographer Laura Cook went in search of some of that Morrocan magic in February. 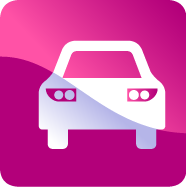 Marrakech is a shopper’s dream and a shopper’s nightmare; crowded streets heaving with will-versed salesmen and everything comes at a price and yet the fourth largest city in Morocco still has a hypnotic allure for tourists and locals alike. 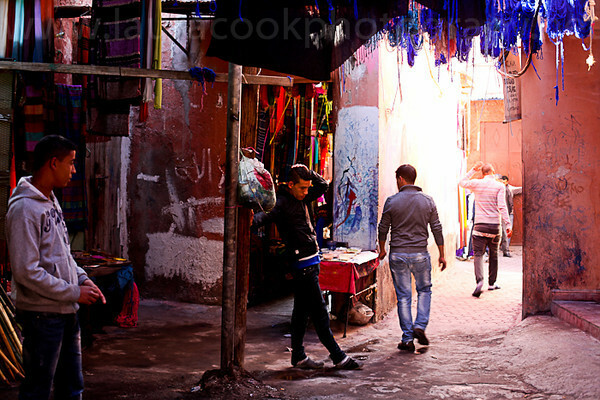 Marrakech is perhaps most famous for the sprawling traditional Berber market. Here by day traders flog wares ranging from meat to metalwork and from silk to slippers and by night the main square of Djemaa el Fna lights up with the glow of lanterns and the smoke from food stands. Getting lost in the souks is part of the experience, neatly defined spaces soon begin to bleed into one another as you walk through the cobbled maze that makes up the heart of the world celebrated emporium. 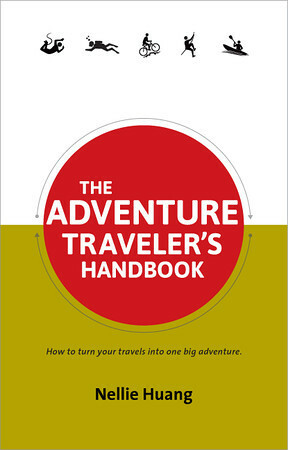 Marrakech is a tiring destination to spend time in but also one that leaves you wanting more. 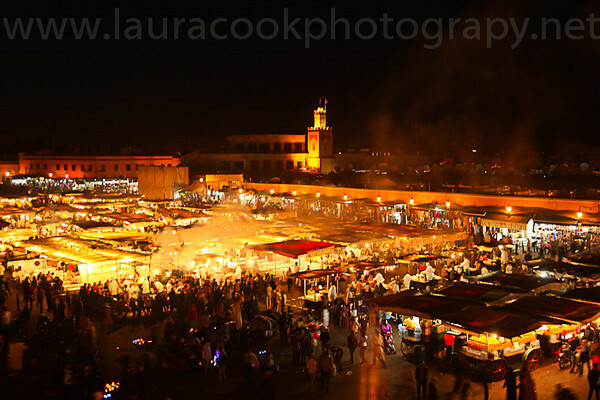 Here are some of Laura’s images from the central souks and Djemaa el Fna. 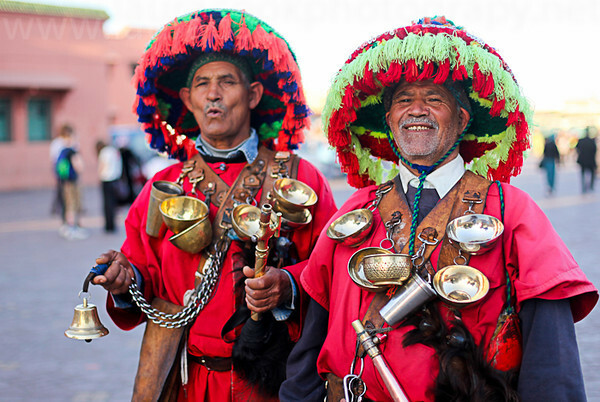 UNESCO recognize Djemaa el Fna as a place of important cultural significance marked by the tradition of flamboyant characters such as bell-ringers, water-sellers and magicians coming together daily over many centuries. 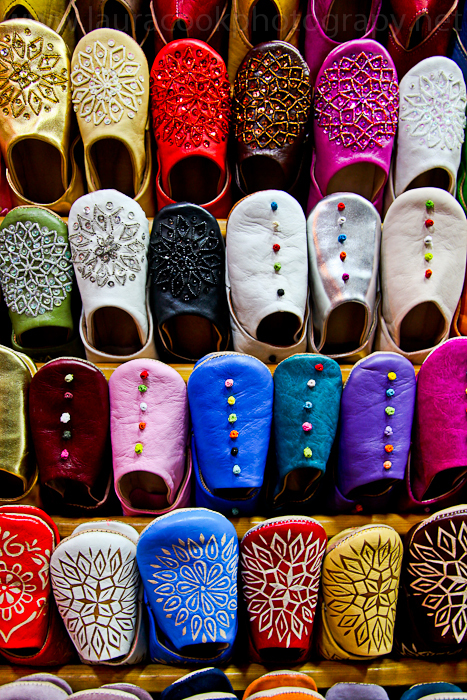 Colorful slippers line the walls of one of the shoe-boxed sized shops in the medina. Djemaa el Fna is the main trading square in Marrakech. 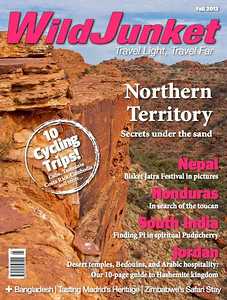 Famous for its cobra-charmers and henna artists that pursue tourists with change to spare. At night the square lights up with food stands and storytellers that gather around glowing lanterns. 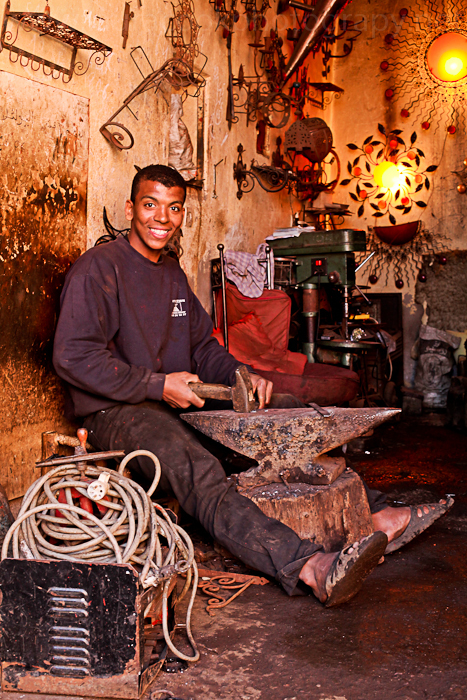 A metal worker takes a quick break and is happy to pose for a photograph. 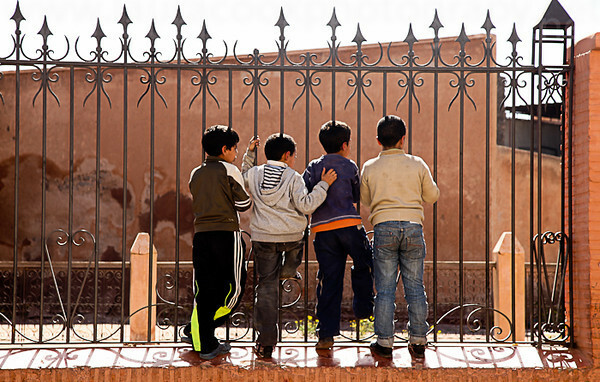 Children talk and play together outside the Ben Youssef Mosque which is in the middle of the medina. 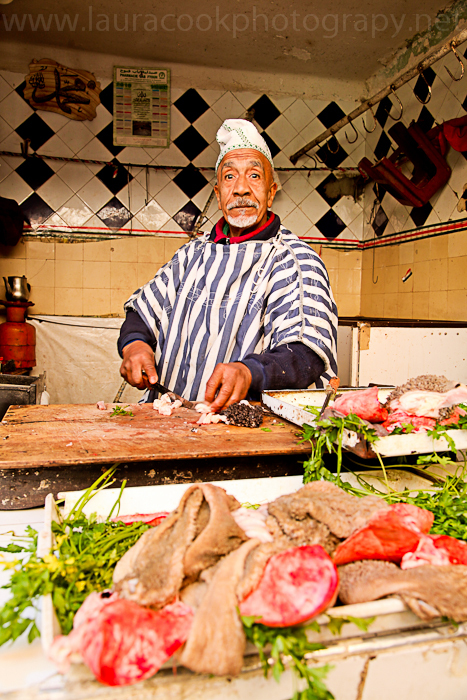 A butcher chops up meat ready for the next customer. Light floods the line of small shops through the wooden slats that cover one of narrow alleyways. 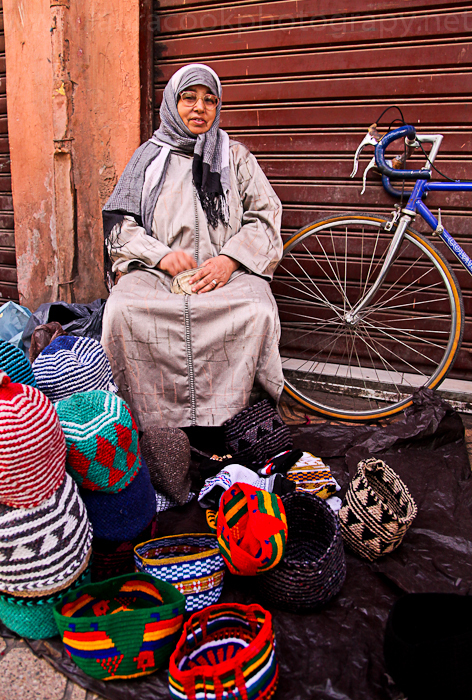 A woollen hat seller sits waiting for another sale. 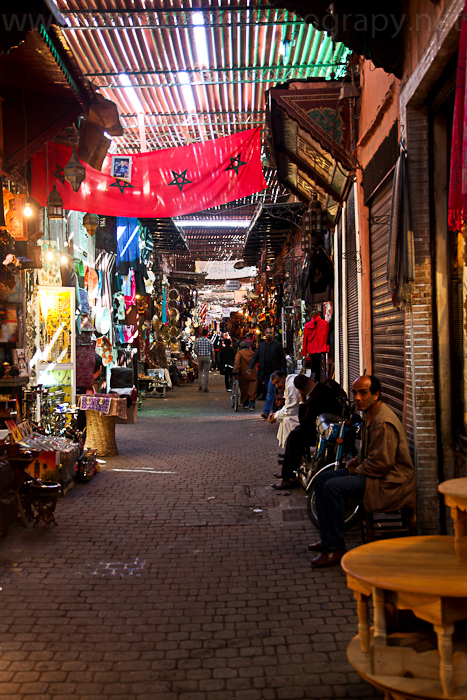 The Dyers Souk hidden in the center of the Kasbah is marked by colored silks hanging from the ceilings of the stalls. 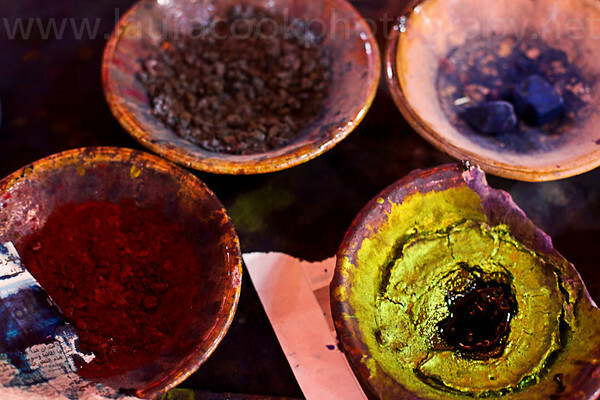 Both synthetic and natural dyes are used to color the cloth sold in the souk.